Ferdy Murphy provided Katie Walsh with POKER DE SIVOLA to outstay her close friend and rival Nina Carberry on BECAUSEICOULDNTSEE and win today’s National Hunt Chase at Cheltenham. After jumping the final fence together, the two girls fought out a thrilling finish with Katie giving her horse a fine strong ride to score and leave her father Ted unusually lost for words whilst live on Channel Four. Katie too was speechless and overcome with this, the biggest win of her career on what she described as “the best day of her life”. Many congratulations to all connections on a great victory. POLLY GUNDRY achieved a personal target when she firstly equalled (on MULLIGAN PET) and then (aboard NED THE POST) broke Alison Dare’s record to claim the most wins ever ridden by a lady point-to-point jockey at Wadebridge today. 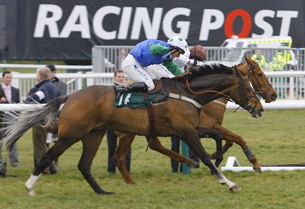 It was especially satisfying for Polly when both winners were trained by she and her partner Ed Walker. 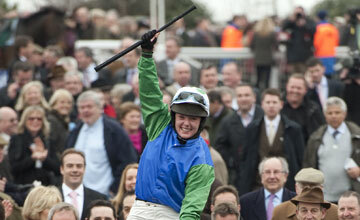 Polly has won the ladies’ point-to-point title 7 times since she began point-to-pointing at the age of 16 in 1992. At the close of play today her winning total stands at 288. Many congratulations to Polly who is such a great and modest ambassador for our sport. Amateur riders will be issued with a personal badge and one for a guest if required for the day on which they are riding, provided their name is published in the National Press as engaged to ride. Amateur Riders whose names are not so published may purchase badges from the Club Office and the purchase price will be refunded, if they are subsequently declared to ride on that day, on application to the Clerk of the Course, Mr Simon Claisse, Prestbury Park, Cheltenham, Glos. Amateur riders who have purchased tickets in advance in excess of their requirements may apply for a refund in writing within 7 days of the meeting. Adam Wedge enjoyed the biggest success of his career to date by making all the running on Di Kaprio in the bumper at Doncaster and going on to score at 66-1 for his boss, trainer Chris Bealby. This was only Adam’s second win under Rules but he enjoyed 9 point-to-point wins last season and has added to that tally with another couple of wins already this season. Many congratulations to Adam. A couple of places have become available in the charity race to be held at CHEPSTOW RACECOURSE on THURSDAY 25TH MARCH. Great chance to gain experience for horse & rider, give point-to-pointer prep race or just have fun raising money for a good cause – local charity PAUL’S PLACE. Riders also invited as guests at charity lunch. For further details please e-mail sph.oliver@btinternet.com or call 01886 884488.